U.S. President George W. Bush may be saying goodbye to Tony Blair. But he gets to say hello to Nicolas Sarkozy. The new French president is seen as friendly to the United States, sure to be a welcome change from the merciless tormenting Bush received from Sarkozy's predecessor, Jacques Chirac. Sarkozy is one of a couple of new leaders that make Europe a more comfortable place for Bush to be these days - even with the impending departure of Blair, the British prime minister who has been Bush's most steadfast foreign ally. Bush and Sarkozy, in office less than a month, were to sit down Friday on the sidelines of a summit of eight industrialized democracies. It will be their first meeting since Sarkozy's election, and their second overall; the first was September in Washington. 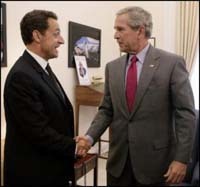 Bush has said little about Sarkozy. Asked what he thinks of the new French leader in an interview this week with reporters, Bush merely said: "I haven't met him yet - I have met him, excuse me, but not as president." To be sure, Sarkozy does not fall in lockstep with U.S. policies. For instance, he, like Germany Chancellor Angela Merkel, the summit host, had pushed for hard greenhouse gas emission reduction targets out of the week's gathering. French officials said Sarkozy told Bush during a working session Thursday that "quantitative targets" on emissions were not negotiable. "We cannot wait anymore," Sarkozy said. The agreement on climate change produced by the leaders promises only to consider a goal of a 50 percent cut by 2050 as one option for tackling global warming. Instead of adopting that approach, proposed by Merkel, the leaders came around to Bush's insistence that a to-be-determined, and not necessarily binding goal be set later, by a wider group that includes emerging economies. Still, Sarkozy earned the label "Sarko the American" from some in France during his campaign. Merkel is another place Bush can now look for friendlier ties. She has made it a goal to strengthen relations with the United States. Merkel succeeded Gerhard Schroeder, who had partnered with Chirac in an alliance of unrelenting opposition against the U.S. on the war. On the final day of the Group of Eight summit, the leaders are focusing on aid to Africa. Critics say all the nations are lagging on the promises they made two years ago, at the British-hosted summit, to double assistance to the troubled continent by 2010. The leaders also are holding discussions with China, India, Brazil, Mexico and South Africa, all developing nations not G-8 members. From Germany, the president flies to Poland for a quick, three-hour stop. He spends the night in Rome. In Poland, meetings with Polish President Lech Kaczynski at that country's equivalent to the American presidential retreat at Camp David serve as a bookend to Bush's trip-opening visit to the Czech Repubexclic. Bush has chosen the two nations as the sites for a new missile defense system. That system has been a source of much heated dispute with Russia. On Thursday, Russian President Vladimir Putin presented Bush with a surprise counterproposal built around an existing Soviet-era radar system in Azerbaijan rather than the new defenses in Poland and the Czech Republic. Bush said he would consider it.